Review all the new data on our humanized target models for human-specific CD40 and combination regimen assessment, and how we’re using PBMC and HSC humanized mice to model graft vs host disease. 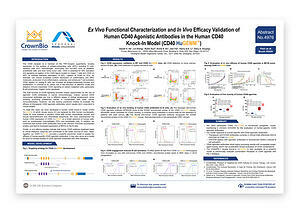 Our humanized target model platform is the focus of two posters at AACR this year, the first being our new CD40 model. The concept of this platform is to provide humanized drug targets (such as checkpoint proteins) within a functional mouse immune system. This allows the in vivo evaluation of human specific immunotherapies such as human anti-PD-1, anti-CTLA-4 etc. CD40 signaling has a dual function - inducing effective innate and adaptive immune responses through APC activation, as well as triggering apoptosis through signaling on certain malignant cells. This provides unique opportunities for CD40 agonistic antibodies in cancer immunotherapy. It also means we need preclinical models for testing human specific agents, as therapeutic CD40 agonistic antibodies don’t usually cross-bind to mouse targets. 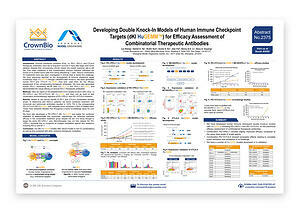 We’ve developed a human CD40 knock-in model specifically to test human antibodies. Mouse CD40 exons 2-5 have been replaced by their human counterparts. This means the knock-in mice express chimeric CD40, with a human extracellular domain and mouse transmembrane and intracellular sequences. Poster 4976 details the validation of this model. Within the knock-in model, CD40 expression has been characterized on a broad spectrum of mouse cells, such as lymphocytes, macrophages, dendritic cells, and endothelial cells. We’ve also confirmed that human CD40 antibodies bind to the hCD40 recombinant protein on B cells, inducing B cell activation. In vivo efficacy testing of human CD40 agonists against the MC38 syngeneic cell line engrafted in this model is also presented. Treatment leads to robust antitumor response, with improved model survival and acceptable single agent toxicity. Overall, our human CD40 knock-in model provides a powerful preclinical model to test human-specific CD40 agonistic antibodies, and can also be useful for proof of concept studies of CD40 agonistic antibodies combined with other agents. As immunotherapy continues to progress towards more combination regimens, we’ve also developed humanized target models to assess two human specific checkpoint inhibitors in one model. 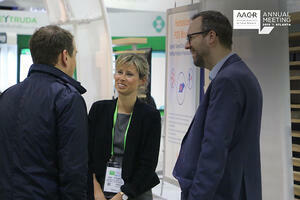 AACR Poster 2375 details our double knock-in humanized target platform, for assessing combination PD-1/PD-L1 and PD-1/CTLA-4 checkpoint inhibitor regimens. The development strategies and FACS validation of both models are presented, with each model being developed through breeding individual single knock-in models. Efficacy data for our first two double knock-in models is shown. The PD-1/PD-L1 model has been treated with atezolizumab (anti-PD-L1) and nivolumab (anti-PD-1) both singly and in combination. Combination treatment actually showed improved efficacy over the two single agents, despite both drugs targeting the same PD-1/PD-L1 axis. It’s possible that the single agents aren’t fully releasing this checkpoint blockade due to the actions of other compatible ligands and receptors, like PD-L2 or B7-1. Our PD-1/CTLA-4 double knock-in model was treated with combined and single agent nivolumab and ipilimumab (anti-CTLA-4). The combination regimen resulted in synergistic effects, with complete tumor remission seen in a large proportion of treated models. These models remained disease-free following a tumor rechallenge study. Our dKI humanized target models offer a robust platform for testing human-specific immune checkpoint inhibitor combinations, with new models such as PD-1/OX40, PD-1/CD137, PD-1/LAG3, and PD-1/TIGIT expanding the range of combinations which can be assessed. Our final poster on humanized models looks at using human PBMC and hCD34+ engrafted into NSG™ mice as potential models for acute and chronic graft vs host disease (GvHD). Current GvHD models are mostly allo-transplantation between mice, which are often criticized for having poor physiological relevance. The xenotransplantation of human donor cells into NSG mice could address some of these limitations. Poster 2342 details the methods behind model development, and initial model assessment. Human PBMC derived from normal donors were transplanted into NSG mice for modeling aGvHD. 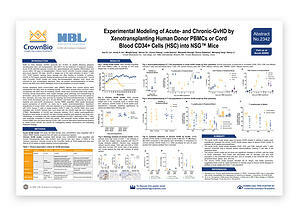 cGvHD was modeled by the transplantation of cord blood derived hCD34+ HSCs also into NSG mice. In the aGvHD model, severe GvHD (Grade 3) was seen starting around 4 weeks post-engraftment. The model shows elevated CD45, CD3, and CD8. There’s also reductions in naïve T cells, CD4/CD8, and a central memory/effector memory T cell ratio in the peripheral blood. In contrast, signs of severe GvHD (Grade 3) weren’t seen in the cGvHD model until 34-40 weeks post-engraftment. The model didn’t show any significant changes in hCD45+, but was associated with elevated CD3 and CD4 populations in the peripheral blood and skin, and an increase in the CD4/CD8 ratio in the peripheral blood, spleen, skin, and liver. Overall, murine models using adult human PBMC and cord blood derived CD34+ HSC could be alternative experimental systems to model human aGvHD and cGvHD, for investigating disease mechanisms and evaluating novel treatment strategies. Read more about our fifteen AACR19 posters, with posts on syngeneic and PDX models, and the novel technologies and assays we’re presenting this week.